As customers issues get more complex - as a result of factors such as multi-country operations, regulations, and more demanding markets, Sales increasingly need to use specialist consultants to help explore the true issues, devise options for change and solutions, and help implement them. Sales can talk to these points and may well do a lot of the related work, however, it rarely is efficient or wise to have them spend most of their time gathering information, analysing issues and developing detailed recommendations for change. Thus, why commercial organisations use virtual or dedicated expertise to go into prospects and customers and run a magnifying glass over everything related to issues they believe exist. Such pre-sales consultancy can constitute different forms in different industries, ranging from being the spearhead into large prospects (management consultancy type skills combined with sales ethos) through to 'techies' who working to Sales in putting together a technical solution. 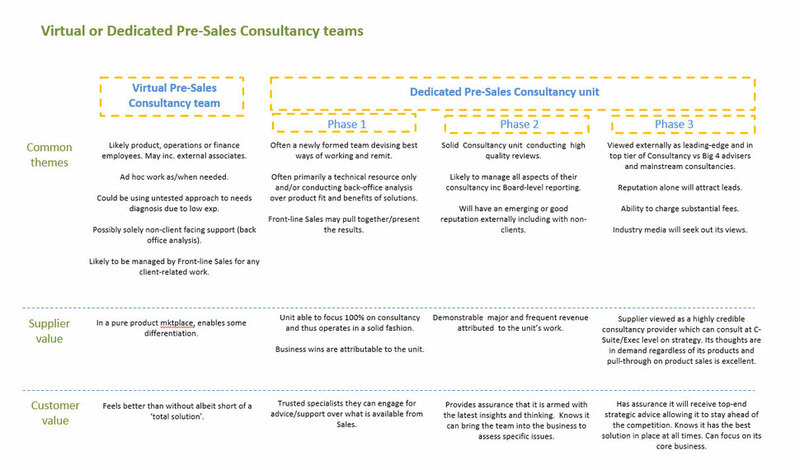 We've found there's typically 4 stages of development existing for pre-sales advisory or consulting units. If you have a function such as this in your organisation, you may want to reflect. Is it a true differentiator against what the competition provide? Are you getting high performance? What is the vision and journey for the unit?